Collect your Pocket WiFi at Incheon, Gimpo or Gimhae Airport, or your accommodation (Free Shipping). 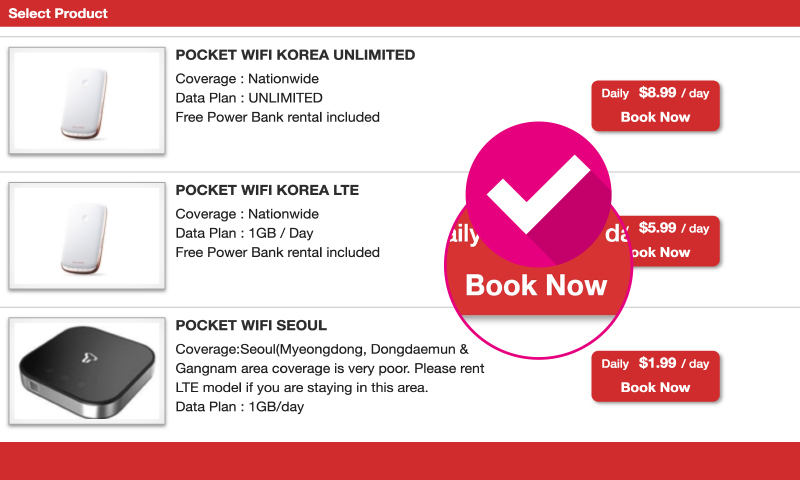 Return your Pocket WiFi at Incheon, Gimpo or Gimhae Airport. Your security deposit will be refunded to your credit card. A guidance on pickup and return is included in the confirmation email that will be sent to you upon reservation. If you are picking up at airport booth, please show your reservation confirmation email to the staff. Please note that our pickup and return service at Incheon airport operates 24 hours a day. Gimpo airport booth operates from 6:00 AM to 9:00 PM, and Gimhae airport operates from 6:00 AM to 10:30 PM. If you arrive in Korea before or after our operating hours, please leave your accommodation information in the “Comments” section of our reservation form, then we will send it to your accommodation at no extra charge. If you need to return after our operation hours at the airports, please contact us. For delivery to your accommodation, reservation requests need to be submitted 3 business days prior to your arrival. And please note that your name should match your hotel reservation name. If they do not match, the hotel may not hold the pocket wifi for you. For delivery to accommodations without 24 hour reception staff (e.g. Airbnb rentals, guest houses, serviced residential apartments and so on), please include a mobile phone number of your Korean host. This is the page for Pocket WiFi Rental Procedure.